Most, if not all, proteins destined for the organelles and membranes of the endomembrane system - the Golgi complex, lysosomes, endosomes, the nuclear and plasma membrane – are in eukaryotic cells initially translocated across the endoplasmic reticulum membrane (1). These proteins are known as secretory proteins and their transport can be accomplished through mechanistically distinct translocation modes (figure 1 adapted from 1). 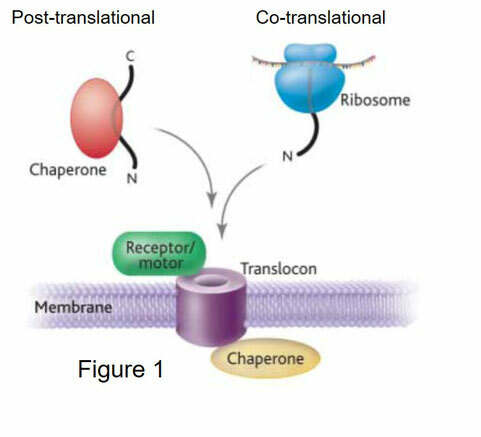 For example, in co-translational targeting proteins are directed to the endoplasmic membrane while they are being synthesized on ribosomes, whereas some proteins are transported after their translation, thus, post-translationally (2). Pioneering experiments by Günter Blobel and coworkers established that signal sequences are responsible for targeting secretory proteins to the endoplasmic membrane (3). A signal sequence comprises an N-terminal extension of about 20 to 30 residues that specifies membrane translocation of the adjacent mature domain and is typically cleaved following transport. Likewise, membrane proteins are also synthesized with an N-terminal targeting signal, which usually comprises the first transmembrane domain (TMD), but this is not proteolytically removed and is therefore known as a signal anchor sequence (1). Hydrophobicity of the targeting signal is an important factor in determining whether a protein is funneled into the co-translational or post-translational pathway. It has been shown that secretory proteins with a hydrophobic signal sequence as well as membrane proteins are in general translocated co-translationally, whereas proteins with a less hydrophobic signal sequence are transported in a post-translational fashion (2). Both pathways converge at the Sec61 translocation channel made up of an α, β and γ subunit embedded into the endoplasmic membrane (figure 1). In co-translational targeting, the signal sequence is recognized by the signal recognition particle (SRP) as soon as it emerges from the ribosomal exit tunnel, resulting in translational arrest. After this, the ribosome-nascent-chain-SRP complex is delivered at SRP receptor at the translocation channel and translation is resumed. The elongating polypeptide chain moves subsequently into the translocation channel and into the lumen of the ER. Hydrolysis of GTP triggers disassembly of the SRP-receptor complex, thereby initiating another targeting cycle (2). The SRP has typically a strong affinity for hydrophobic targeting sequences and moderately hydrophobic signal sequences are therefore overlooked by it. Hence, secretory proteins equipped with these signal sequences escape recognition by the SRP but need to remain unfolded after release from the ribosome (2). This is achieved through association with molecular chaperones of the Hsp40 class that probably also target the unfolded polypeptide to the translocation channel (4). While the Sec61 machinery is required for protein translocation in both the co and post-translational targeting pathways, both processes depend on a structurally different Sec61 complex. Specifically, during post-translational translocation in yeast the Sec61 channel associates with another membrane protein complex, known as the Sec62/Sec63 complex. This represents a tetrameric complex comprising Sec62, Sec63, Sec71 and Sec72. Additionally, the Sec61 channel partners with Bip, a luminal Hsp70 chaperone, that binds to the polypeptide during translocation, and thereby prevents its backsliding through the channel (2). In contrast to co-translational translocation, the molecular details of post-translational translocation are not well understood. However, recently determined high resolution structures of the post-translational translocation machinery from yeast have provided the first mechanistic insights into this process (5,6). Here, I will discuss these novel structures as well as our current understanding of post-translational translocation in eukaryotes. Accumulating evidence indicates that post-translational translocation is found in all organisms. However, its importance appears to be species-dependent. In mammals, for example, the vast majority of proteins are targeted co-translationally, while in baker’s yeast and bacteria both translocation modes are equally important. Most post-translationally translocated proteins are small – less than 75 residues – and are equipped with a moderately hydrophobic signal sequence (7). Owing to this, these proteins escape recognition by the co-translational SRP system which preferentially interacts with hydrophobic targeting signals. Figure 2 (adapted from 2) is a schematic representation of post-translational translocation in yeast, which probably holds for all eukaryotes. Following completion of its synthesis, the polypeptide is released from the ribosome and kept in an unfolded state through association with cytosolic chaperones. These probably also deliver the polypeptide at the translocation site in the endoplasmic membrane, comprising the Sec61 channel and the associated auxiliary Sec62/63 complex. This latter complex is made up of four membrane proteins, namely: Sec62, Sec63, Sec71 and Sec72 (2). 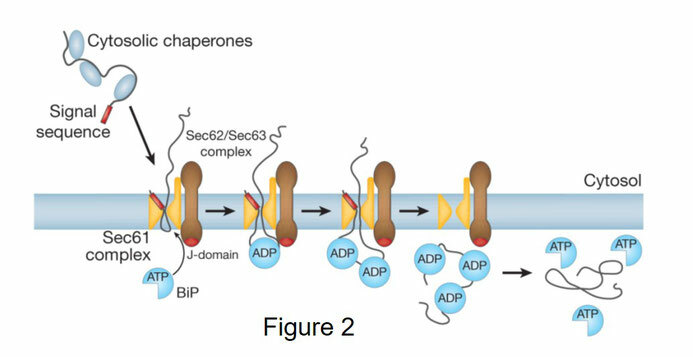 Sec72 contains multiple chaperone binding sites and it is therefore conceivable that Sec72 captures chaperone-bound substrate proteins. This represents the first step in the post-translational translocation cycle and during this step all chaperones are released from the polypeptide, which is subsequently inserted into the Sec61 channel as a hairpin. Once inside the channel, the polypeptide is bound by the luminal Hsp70 chaperone BiP that prevents its backsliding into the cytosol. This, therefore, creates an overall forward translocation movement. 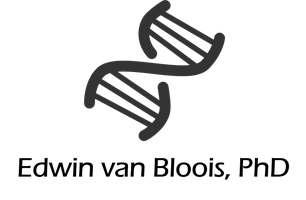 It has been established that BiP contains a nucleotide and substrate-binding domain (SBD). The latter can either be in an open or closed state depending on whether ATP or ADP is bound. ATP-bound BiP contains an open SBD and interaction with the J-domain of Sec63 triggers ATP hydrolysis and subsequent closure of the SBD around the polypeptide that emerges from the Sec61 channel (2). Ongoing translocation allows binding of other BiP molecules, which continues until translocation, is completed. After this, ADP is exchanged for ATP which triggers opening of the SBD and BiP is released from the substrate. Despite its prevalence in yeast and bacteria, post-translational translocation in prokaryotes is mechanistically different from its eukaryotic counterpart. In bacteria, the SecY channel cooperates with SecA during post-translational translocation. This is an ATPase that associates with the SecY complex and uses the energy of ATP hydrolysis to push the polypeptide through the channel (8). Post-translational translocation is initiated by binding of SecB, a cytosolic chaperone, to the newly synthesized polypeptide chain. Subsequently, SecB delivers the polypeptide chain at the translocation site and interacts with SecA after which the polypeptide is handed over to SecA. Following insertion into the channel, the substrate protein is translocated by SecA using a pushing mechanism. Co-translational targeting by the SRP was the first pathway that was discovered for protein transport across the endoplasmic membrane in eukaryotes (9). However, it was subsequently found that the model protein prepro-α factor is post-translationally translocated into yeast microsomes (10). Genetic and biochemical experiments identified several components that are required for protein transport in yeast. These include the Sec61 channel, made up of an α,β and γ subunit, as well as another complex comprising Sec62, Sec63, Sec71 and Sec72 (11). Of these, Sec62 and Sec63 are essential for cell viability unlike Sec71 and Sec72. It was, moreover, next found that Sec63, Sec71 and Sec72 copurify with BiP, a luminal Hsp70 chaperone (12). Using an in vitro translocation system, post-translational transport was reconstituted using proteoliposomes containing the purified Sec61 channel and the Sec62/63 complex from yeast, while BiP and ATP were also required for efficient translocation (13). Together, these results show that the Sec61 channel not only mediates co-translational translocation but is also required for post-translational protein transport. In the co-translational pathway the Sec61 channel associates with the ribosome, while the Sec62/63 complex is the major channel partner during post-translational translocation. However, due to the lack of structural information on the posttranslocational Sec complex the mechanistic details of post-translational protein transport are poorly defined. With regards to the latter it should be noted that recently detailed structures of this complex were determined by cryo-EM (5,6). Figure 3 shows the structure of the post-translational Sec complex from yeast at 4.1 Å (5). This was obtained by single particle cryo-EM of the affinity purified complex from detergent solubilized yeast membranes and reveals that the post-translational Sec complex is made up of the Sec61 channel, Sec63 (in green), Sec71 (in magenta) and Sec72 (in grey). In turn, the Sec61 channel comprises Sec61(in blue), Sss1 (in pink) and Sbh1 (in yellow). No clear density for Sec62 was observed in the final electron density map, preventing inclusion of its atomic model in the final structure. The overall structure of the complex is shown as a surface representation (upper left panel with subunits indicated) or as a ribbon diagram (upper right panel with subunits indicated). The latter panel reveals that Sec61 contains 10 TMDs and is tightly associated with Sss1 and Sbh1, two smaller proteins that span the membrane one time. Sec63 has two TMDs, but its J domain that interacts with BiP is not observed in the structure possibly due to its flexible nature. Sec71 is a single-spanning membrane protein that anchors Sec72 to the ER membrane. Importantly, Sec71 and 72 are not found in mammals. A front (left) and top view (center) of Sec61 is provided in the bottom panels with the plug in red, TMD2 in orange and TMD7 in grey. All other subunits are omitted for clarity. Sec61 contains 10 TMDs that divide the protein into N- and C-terminal halves with TMD 1-5 and 6-10. Sec61 is open on one side (the front) that probably functions as a lateral gate (between TMD 2 and 7), enabling the channel to open toward the lipid bilayer. 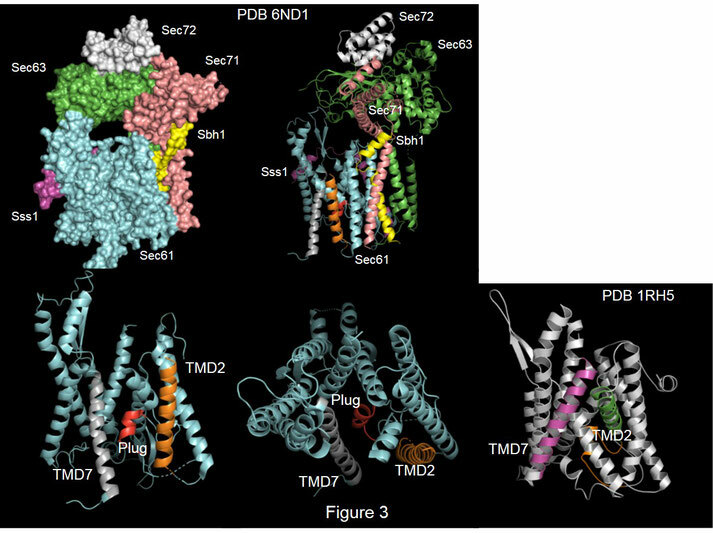 A structure of the homologous bacterial SecY channel in the closed state is provided in the bottom right panel with TMD7 in pink and TMD2 in green. One striking feature of Sec61 structure is a fully open lateral gate, while the plug is located in the center of the channel suggesting that it is closed. Opening of the lateral gate is caused by major conformational changes in TMD2, 3 and 4. Thus, opening of the gate and channel are probably separate events. Channel opening is caused by insertion of a polypeptide and subsequent displacement of the plug, whereas opening of the lateral gate is triggered by binding of a translocation partner, such as the ribosome, SecA, or Sec62/63. In the case of co-translational translocation binding of the ribosome opens the lateral gate partially, while in post-translational translocation, binding of Sec62/63 triggers wide opening of the lateral gate. This allows moderately hydrophobic signal sequences to exit into the bulk lipid and explains why these signal sequences are functional in post-translational translocation. Sec63 is associated with Sec61 via cytosolic loops 6/7 and 8/9, resulting in similar interactions as binding of the ribosome. This forces Sec61 in a gate-opened conformation. Binding of Sec63 not only controls opening of the lateral gate but also prevents ribosome binding to Sec61. Based on the structural data discussed above, a model for post-translational translocation has been proposed p(figure 4 adapted from 5). In the resting state (A) the channel and lateral gate are closed. The plug domain that blocks the channel is indicated by an asterisks. Binding of the Sec62/63 complex (B) primes the channel for translocation. The lateral gate is fully opened by Sec63, while the translocation channel remains blocked by the plug. A protein substrate destined for post-translational translocation is kept in an unfolded state through association with cytosolic chaperones, that include Hsp70s, and target the polypeptide to the Sec61 complex. Here, substrate proteins are captured by Sec72 that interacts with Hsp70, thereby positioning the substrate for transfer into the translocation channel. Subsequently, the polypeptide inserts as a hairpin into the channel (C) with the signal sequence (SS) exiting through the lateral gate and binds to a groove on the outside of the gate. The following polypeptide is retained in the translocation channel and at this stage chaperones can no longer remain bound because they don’t fit between Sec63 and Sec61. Therefore, all substrates are released from the polypeptide following insertion into the translocation channel. After exit of the signal sequence, the plug domain is probably displaced, which opens the channel towards the lumen. This enables translocation of the polypeptide. It is well established that the highly conserved Sec complex plays a crucial role in protein export in all organisms (1,2). For example, in bacteria the SecY complex facilitates transport and insertion of proteins into the cytoplasmic membrane, while in eukaryotes the Sec61 channel performs the same functions in the endoplasmic membrane (2). Protein transport can occur during or after translation via the so-called post-translational or co-translational pathway. Both pathways are utilized by all organisms but their importance seems species-specific. In mammals the vast majority of proteins is directed towards the endoplasmic membrane co-translationally, while in yeast and bacteria both pathways are equally important. In eukaryotes, co-translational translocation is initiated by binding of the SRP to a hydrophobic targeting signal of the substrate protein as it emerges from the ribosome. This temporarily halts translation and the SRP-ribosome-nascent chain complex is subsequently delivered at the Sec61 channel embedded into the endoplasmic membrane. After transfer of the nascent chain to the Sec complex, translation continues and the polypeptide is pushed through the translocation channel (1). Secretory proteins with a moderately hydrophobic signal sequence escape recognition by the SRP system and are therefore funneled into the post-translational pathway. These proteins are kept in an unfolded state after release from the ribosome through association with cytosolic chaperones, which also target the polypeptide to the Sec channel. Following capture of the substrate protein by the Sec61 channel, the polypeptide is bound by the luminal Hsp70 chaperone BiP which prevents it’s backsliding into and in fact “pulls” the substrate into the lumen (2). Although both pathways converge at the Sec61 channel, both translocation modes require a structurally different Sec61 complex. In yeast, co-translational translocation is performed by the Sec61 complex made up of Sec61, Sss1 and Sbh1, while, during post-translational translocation the Sec61 channel associates with another membrane protein complex, known as the Sec62/Sec63 complex (2). This represents a tetrameric complex comprising Sec62, Sec63, Sec71 and Sec72. Of these, Sec62 and 63 are essential for cell viability unlike Sec71 and 72. These proteins are not found in mammals, while in humans, Sec62 and 63 are frequently mutated or over expressed in different tumors. The molecular details of the co-translational pathway are reasonably well understood, in contrast to post-translational translocation. This is primarily caused by a lack of structural information and with regards to this the recently determined atomic structures of the post-translational Sec complex from yeast (5,6) are of great importance because they provide mechanistic insight into post-translational protein export. 1. Wickner W, Schekman R. 2005. Protein translocation across biological membranes. Science. 310: 1452-1456. 2. Rapoport TA. 2007. Protein translocation across the eukaryotic endoplasmic reticulum and bacterial plasma membranes. Nature. 450: 663-669. 3. Blobel G, Sabatini DD. 1971. Ribosome-Membrane Interaction in Eukaryotic Cells. Biomembranes 2: 193-195. 4. Ast T, Cohen G, Schuldiner M. 2018. A network of cytosolic factors targets SRP-independent proteins to the endoplasmic reticulum. Cell. 152: 1134-1145. 5. Wu X, Cabanos C, Rapoport TA. 2019. Structure of the post-translational protein translocation machinery of the ER membrane. Nature. DOI: 10.1038/s41586-018-0856-x. 6. Itskanov S, Park E. 2019. Structure of the post-translational Sec protein-translocation channel complex from yeast. Science. 363: 84-87. 7. Zimmermann R, Eyrisch S, Ahmad M, Helms V. 2010. Protein translocation across the ER membrane. Biochim Biophys Acta. 1808: 912-924. 8. Chatzi KE, Sardis MF, Economou A, Karamanou S. 2014. SecA-mediated targeting and translocation of secretory proteins. Biochim Biophys Acta. 1843: 1466-1474. 9. Görlich D, Rapoport TA. 1983. Protein translocation into proteoliposomes reconstituted from purified components of the endoplasmic reticulum membrane. Cell. 75: 615-630. 10. Waters MG, Blobel G. 1986. Secretory protein translocation in a yeast cell-free system can occur post-translationally and requires ATP hydrolysis. J Cell Biol. 102: 1543-1550. 11. Deshaies RJ, Sanders SL, Feldheim DA, Schekman R. 1991. Assembly of yeast Sec proteins involved in translocation into the endoplasmic reticulum into a membrane-bound multisubunit complex. Nature. 349: 806-808. 12. Brodsky JL, Schekman R. 1993. A Sec63p-BiP complex from yeast is required for protein translocation in a reconstituted proteoliposome. J Cell Biol. 123: 1355-1363. 13. Panzner S, Dreier L, Hartmann E, Kostka S, Rapoport TA. 1995. Post-translational protein transport in yeast reconstituted with a purified complex of Sec proteins and Kar2p. Cell. 81: 561-570.